Chloe had accepted the terms of the business arrangement that included marriage to business tycoon Ariston Spiridakou. Her father had put her in an untenable position, and she'd really had no choice. Ariston might not have known the truth of her situation, but he had been almost the perfect husband - considerate, passionate, and committed. He had not been able to give her one thing - love. She could have accepted that, but she'd had to leave when her father had informed her of what Ariston had kept hidden from her. It was three years later, and Chloe may have adjusted to a new life as a divorcee, but she found herself once again facing Ariston. They needed him once again, this time to save her family's business. Chloe didn't want anything to do with the business, but there were too many people whose lives depended on those jobs. Time may have passed, but so many things were just the same. The instant flare of attraction, their passionate responses to one another, and another business proposal that included Chloe to be with Ariston and to not deny him the baby she had promised him once before. 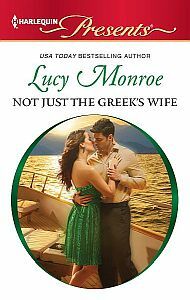 Not Just the Greek's Wife is a passionate reunion romance between two people who came together for a business deal, and gained so much more. Chloe loves her husband, but has to decide if it will be just too difficult to not have her love reciprocated. Although Ariston cares for her, he sees their relationship more in terms of a business, the pros outweigh the cons. It is wonderful watching as the always in charge and in control Ariston finally learns that the emotion behind the pros is love.